Michael Gault. Pic by PressEye Ltd.
Portadown have hit out at the Irish Football Association following news this week that suspensions for two key players dating back to April must kick in today. 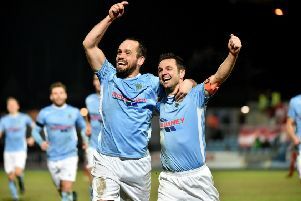 Michael Gault and Mark McAllister will sit out the opening weekend of the Danske Bank Premiership due to bans relating to the April 18 defeat by Glenavon. Anger from the Ports camp relates to the late notice from the IFA that has disrupted preparations for a visit to the defending champions Crusaders. “We were informed via email on Thursday that Michael Gault must serve a three-match ban and Mark McAllister two games,” said Portadown club secretary Bill Emerson. “The referee’s report was only recently discovered. “We had previously been told by the IFA that Tim Mouncey’s suspension was the only ban for the Crusaders match. “Portadown manager Ronnie McFall and myself spent Thursday trying to get in touch with the IFA without success. “We feel it is the latest in a long line of incidents of administrative incompetency by the IFA connected to Portadown. “We have lodged an appeal but not heard any response from the IFA. “We have also sent a strongly-worded email to the IFA expressing our feelings on this matter.